I like puzzle games, so the above headline wasn't meant to sound negative. It's just that if you don't dig puzzlers (or a DSiWare space shooter), you may want to move ahead to the next story, as that's all there is for Nintendo DLC this week. 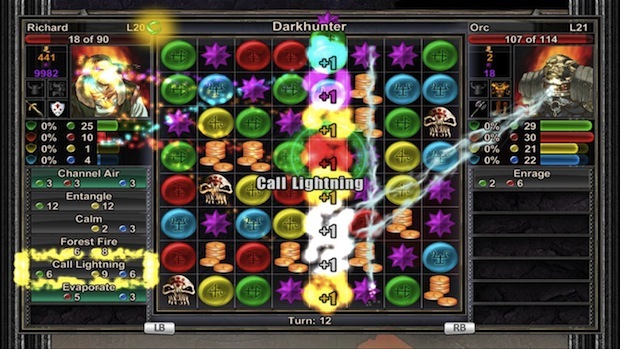 Of all the puzzle games out there, Puzzle Quest: Challenge of the Warlords is a good one. It comes to DSiWare this week for 800 DSi points. 3D Twist & Match may not be as popular, but it's only 200 points. This DSiWare game has you rotating 3D objects to match their silhouettes. And on WiiWare, Overflow (500 Wii Points) has you twisting your Wii Remote to repair an exploded prototype of the most energy-efficient machine ever created before its unveiling. You're mixing colored fuel bits in over 30 levels. Not feeling puzzle-y? Your only option this week is DSiWare space shooter 99Bullets. This 500 DSi Point game is retro styled, and has 10 levels with "incredible bosses."